Pioneer VSX933B Network AV Receiver with 7.2 Channels in Black The all-powerful Pioneer VSX933 makes dreams come true, bringing a boundless media experience to your living room, as this device really does raise the bar in home entertainment. 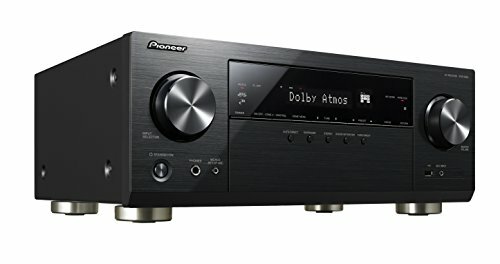 It is more punchy-sounding than ever, with its mighty 135 watts per channel and the 7.2 surround sound will enable you to immerse yourself, especially when watching your favourite movies as it delivers a true cinematic sound experience produced by the Dolby Atmos ceiling or upwards firing speakers. In order to get the very best from these speakers the Reflex Optimiser uses Phase Control technology for an improved focus producing a more natural and less disjointed sound. 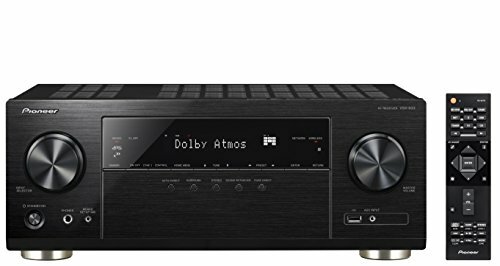 This AV Receiver will satisfy all your audio-visual wishes, as equipped with six HDMI sockets, it will support the most complex AV systems. The device has more streaming options than ever before and now enables connection to Amazon Prime Music, Chromecast, Spotify, TIDAL and Deezer, making this the best choice of AV receiver for streaming your best loved music. The device can be connected up to your HDR-equipped TV and video sources, as supports HDR10, Dolby Vision, HLG and HDCP 2.2, enabling you to play UHD Blu-ray discs and stream UltraHD video in the highest quality, and is also equipped with 4K upscaling. This really will provide you with the most detailed picture on your 4K TV from all sources, without hassle as the HDMI sockets allow 4K pass-through. Plus there is no need for worry if you still wish to connect up older sources, such as your turntable, as you can connect via digital optical, coaxial component, composite inputs or USB sockets allowing you to easily listen to your music library.